Today we covered Author's Purpose. I had several students absent so this is the easiest way for the information to be relayed to you. On a sheet of paper, make a 4-door foldable. 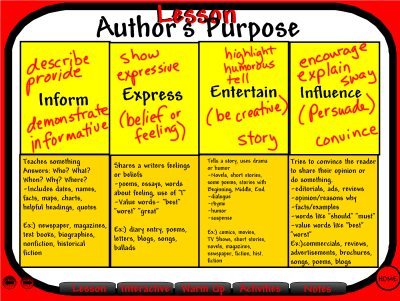 Label each door as one of the four different Author's Purposes as well as vocabulary used for each one. On the inside, copy the notes for each section. The foldable should be glued in your Reading spiral. If you don't have your Reading spiral (it seemed like an awful lot of you were missing them), it is a requirement of my class to have one so bring one! See the image below for the notes necessary to complete the 4-door Author's Purpose Foldable. Click on the image to enlarge it. 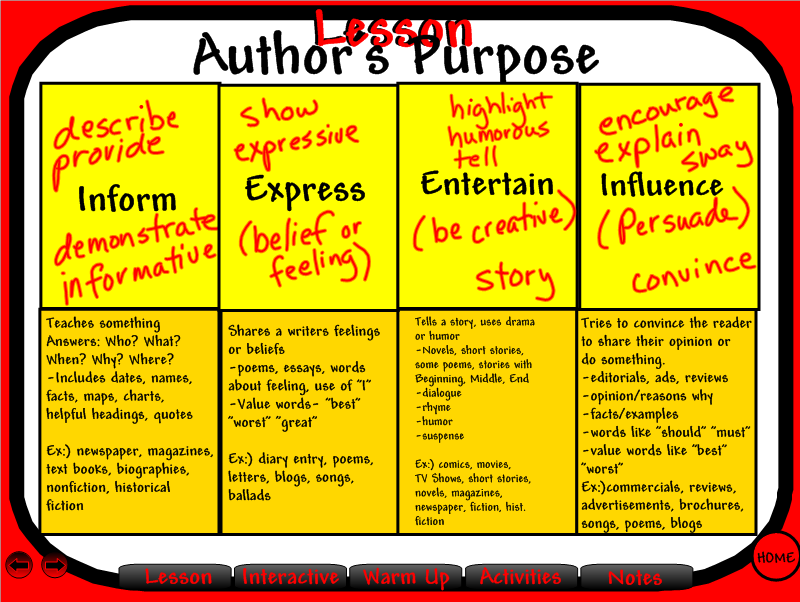 There will be a pop quiz on Author's Purpose coming up very soon- students will need to be able to read a written item and decide if the purpose is to Inform, Persuade, Express, or Entertain. If you have any questions, please e-mail me.